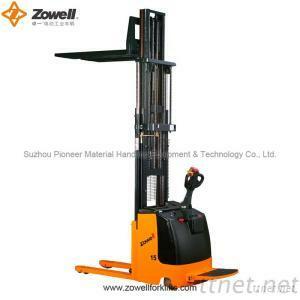 Suzhou Pioneer Material Handling Equipment and Technology Co., Ltd.
Our Zowell standard electric stacker is mainly used for stacking of medium and high intensity, like pallet transport and stack in warehouses, manufacturing industries, retail stores, and so on. It can be operated alone as well as in combination with a platform, And the platform is necessary for ling-distance transport. And the loading capacity of our XE/XEH standard electric stacker ranges from 1000kgs to 2000kgs. 1. Germany Mannstaedt forklift profile for mast building. 2. Swiss BUCHER brand or Italy HYDRAPP Hydraulic pump. 6. Battery side extraction: the side gate and the battery cover are openable. Battery can be removed from the side, making it very convenient to replace and maintain batteries. 7. Emergency reversing device in the handle provides improved operating safety. 8. Emergency power disconnect switch. 9. Braking applied with handle upright and horizontal position, increasing the safety of the truck. 10. Built-in pressure relief valve protects the trucks from overloads, increases the reliability. 11. the mast and the frame are dividable and exchangeable. Industrial Supplies, Material & Cargo Handling Equipments, Material & Cargo Handling Equipments/n.e.s.